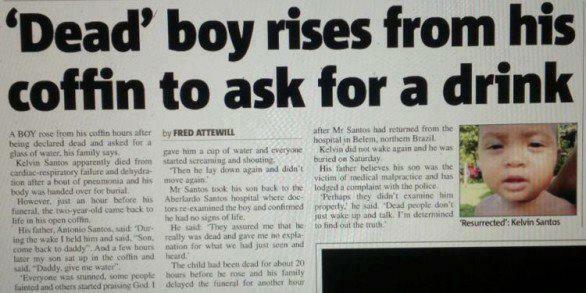 Young Boy Wakes up From His Own Funeral to Ask for a Glass of Water; Dies for the Second Time After! Every once in a while, we come across a story about people waking up from their own funeral or being pronounced dead only to come back to life a few moments later. But none of them compare to the heartbreak that this family endured because of what happened in young Kelvin's wake. 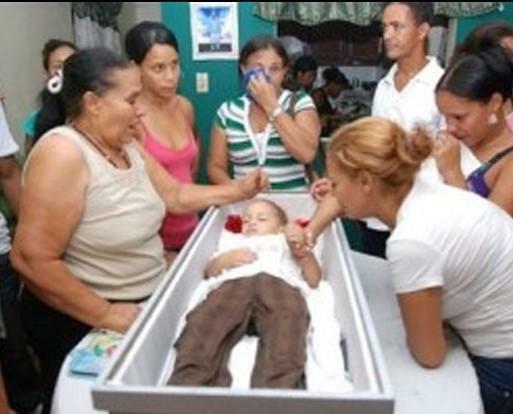 In Brazil, 2-year-old Kelvin Santos suffered from pneumonia. He was brought to the hospital for treatment but his condition worsened as for some reason, the doctors could not treat him. So it was in the hospital where he was pronounced dead. His family, heartbroken for their loss, took him home and prepared a traditional wake for him. To everyone's surprise and terror, Kelvin suddenly regained consciousness and even looked around and asked his father for a glass of water. Everyone was in pure joy for one moment, until the young boy lay back down and could not be woken up again. As it turns out, Kelvin had not really died in the hospital. If his doctors had only paid enough attention, they would have known that the boy's heart beat had just weakened and not stopped. His family is looking into a case against the doctors in the hospital. Kelvin's case is what is known as the Lazarus Syndrome, a condition wherein the heartbeat becomes stable and stronger after a certain amount of inactivity. Though people have been known to experience this, what will most likely happen is that they will live but not have a strong quality of life. That is to say they may be brain dead or their whole body may be paralyzed. Do you know of any stories like these? Would you like to know what happens after death? Tell us all about it in the comments section!